5 mins drive from Gatwick Airport. Melville Lodge is ideally situated, only 5 minutes from Gatwick Airport by car yet away from the flight path and within easy walking distance of Horley town centre with its varied choice of restaurants/pubs, and ancient parish church and a 15th century Inn. 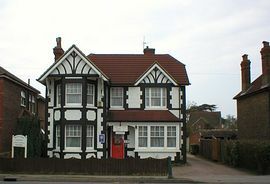 Horley railway station is 10 minutes walk for main line trains to London Victoria or Brighton. Easy access to explore the surrounding Surrey and Sussex countryside with its many tourist attractions. We look forward to having the pleasure of your company. All of our rooms are equipped with a sink, tea/coffee making facilities, Freeview TV, radio alarm clock and fan. En-suite rooms are in addition equipped with their own shower and toilet. Melville Lodge is the 6th house on the left.